Our congratulations to Westercon 64 Guests of Honor, Phil and Kaja Foglio, whose Girl Genius, Vol 8 won the first ever Hugo Award for Best Graphic Story in Montreal at the weekend. The only previous work of sequential art to win a Hugo was Alan Moore and Dave Gibbons’ legendary Watchmen, which won in a one-off category of “Other Forms” in 1988. 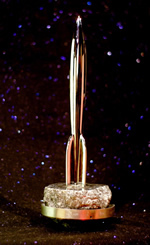 This year’s Best Graphic Story category was a special creation of the Montreal Worldcon, but a vote of the Business Meeting of the World Science Fiction Society at that convention has confirmed the category as a permanent part of the Hugo Awards until at least 2012. Girl Genius topped the nominating ballots and emerged the winner in the Final Ballot after a hard-fought battle with Joss Whedon’s Serenity: Better Days. Update: Although Phil & Kaja were unable to attend Anticipation, they posted their acceptance speech on the Girl Genius web site.